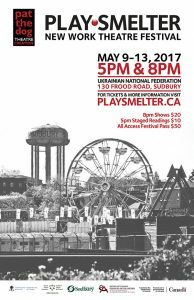 Tickets are now available for PlaySmelter 2017, Sudbury’s new work theatre festival. To celebrate its fifth year, the festival will be presenting the world premiere production of Blind Nickel Pig by Lara Bradley and the Sudbury premiere of Receiver of Wreck by Matthew Heiti. Accompanying these full productions will be exciting first readings of three new scripts by Northern Ontario writers: Pakistani Sugar by Brigitte Gall (Minden, ON), Debwewin (Truth) by Sarah Gartshore (Sudbury, ON) and The Sandcastle by Eli Chilton (Moose Factory, ON). All events will take place May 9-13 at the Ukrainian National Federation, 130 Frood Road. — Sudbury Arts Council. Read more here.